First, thanks go to Carol Taylor for letting me know about my ribbon at the Mid-Atlantic Quilt Festival in Hampton, VA, this weekend. The quilt on the left is my "Doormats 1" and the one on the right is my "Broken Squares," which won the Best Use of Color award in the Innovative Quilt category. SAQA's "Fibrations" traveling exhibition is also on display at the show and includes my "Jet Trails" quilt on the right. Fibrations will go on to the Quilt Fest of New Jersey and then the Denver National Quilt Festival. Marcia cleans the area in front of our postal delivery area. Despite the heavy snow, both our daily paper and mail were eventually delivered. were covered. We were spared the high wind gusts which piled up the snow in nearby areas. The front walk was well covered. We had about 18 inches on level ground after having been spared large storms earlier this winter which targeted coastal areas to the south of our location. It was our turn! Our neighbor plows our driveway in exchange for storage space in one of our barns. He made several passes in the last 24 hours. The trees in the background are about 12 feet high. The middle of winter limits outdoor activity and encourages our artist friends to concentrate on work days at the studio. Here, Nancy Hicks assembles more pieces for her work on the display wall. She won a basket of Kaffe Fasset fabrics at QBL last summer and is using it to create a bargello quilt for her bed. Pat Pauly has two daughters away at college and has been very productive this winter. She is hand sewing the facing on one of the quilts she recently completed. Pat has experience at museums where she has produced displays of exhibitions of various types. She has received a commission from a local collector to prepare a selection of his Navajo rugs for hanging. She is hand stitching reinforced strips on the backs of the rugs for the hanging system. We think these rugs are from the American SouthWest from the early 1900's. They were made for the tourist trade by local artists and further research could probably identify location and perhaps even the weaver/artist. The natural (non-dyed) wool in this rug indicates that the rug is older, as it was probably made before dyed wool was widely available. Today was the day to pack up the quilts going out to two shows. 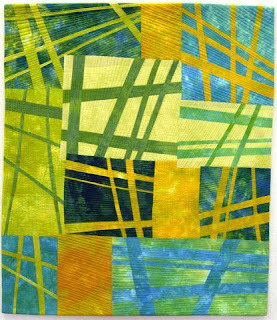 "Yellow Brick Road" was selected to be exhibited at the International Quilt Festival/Chicago in the IQA judged show, Celebrate Spring! This quilt was made from hand-dyed fabrics and is 54h X 50w. The show is April 16 - 18, 2010. "Sea Kelp" is also going to Chicago. It was inspired by the tall sea kelp in the Monterey Sea Acquarium. 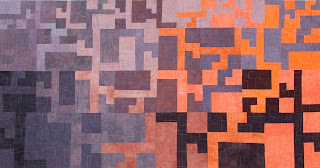 This quilt was made from hand-dyed fabrics and is 32h X 53w. These two quilts were selected to be exhibited at the Quilt Fest of New Jersey VI, "Tri-State Quilt Competition." The Festival runs from March 4-7, 2010. 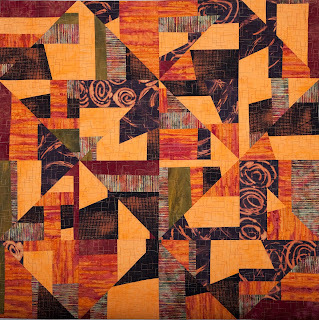 This quilt is "Storm Clouds at Sunrise." It was made from hand-dyed fabrics and is 34h X 66w. "Five Squares" is also headed to New Jersey. 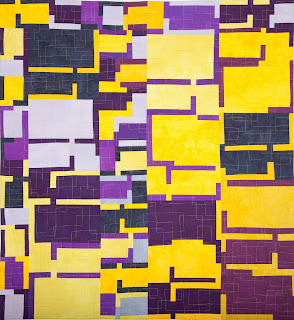 This quilt is made from discharged, hand-dyed, and commercial cotton fabrics. It is 52h X 52w. Priscilla found this wonderful leaf print fabric that might become a focal point for a new jacket or quilt. Although she's hard to see, Suki is on Priscilla's chair and looks like she's checking out the fabrics. Beth brought in all the fabric strips she made from some of her old fabrics while she was away on vacation. They might end up in quilts, totes, or other projects. Priscilla started auditioning fabrics to coordiate with the colorful cross stitched piece she's using as the focal point. The Rochester Area Fiber Artists' group had its first meeting at a new location in East Rochester. The large room accommodates setting up the tables in a large square. Beth Brandkamp is home from her travels in FL and NC and is sporting a wonderful tan. Beth showed us one of the Hmong story quilts she just purchased from Priscilla. Priscilla showed us her Vegetable Man quilt. This is one of the three pieces that Mary Wieser completed recently and shared with us. 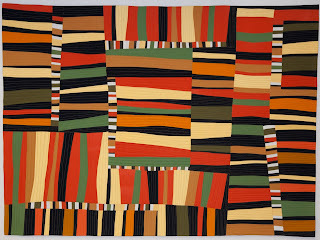 Mary Rankin finished this quilt for her grandson, which involved watching a lot of basketball on tv to get information for the player's pose and his uniform. Sarah Terry just finished this quilt which incorporates pieces of metal that she burnished. Karen Rakowski made this one-block wonder quilt.